There is nothing quite like those summer nights around the bonfire or the sight of vibrant foliage on a mid September day. Here on Shandelee, we invite you to exchange “I do’s” amidst our wildflower-filled meadows, mingle at cocktail hour overlooking our natural backdrops, and continue your celebration in our rustic pole barn followed by dancing under the stars. If you are a fan of the outdoors, this is the season for you! Not only is the setting at its peak, the food will be as well. Our garden onsite is home to a bounty of produce that will be incorporated into your affair from garnishes for signature cocktails to delicious summer veggies to those yummy fillings for desserts. We specialize in weekend experiences and can help get the festivities started a little earlier - and give you less to worry about knowing your guests are having a fun-filled day before the vows and celebrations begin. How about a game of baseball in the meadows, a group fly fishing outing, canoe races on Shandelee Lake or a hike in Catskill Park? Or maybe a tour of some of the great breweries and distilleries in the area followed by a visit to our furry friends at Buckbrook Alpacas (you heard us right!). One thing is for sure - it will be a weekend full of endless memories for years to come. Enjoy carefully crafted menus showcasing best in seasonality with playful takes on everything from traditional BBQ to elevated paella. Have your guests watch Chef cook off smoked brisket, pulled pork and classic BBQ chicken on our outdoor grill. Ask us about the Beaverkill trout, it’s a fan favorite! Oysters, shrimp and a towering selection of cheeses more your style? Our Chef can customize a menu for you and your fiancé based on what your guilty pleasures are. When it comes to beverages, we are fortunate to be “right next door” to a wonderful selection of breweries, distilleries and wineries. We proudly support our 'local bar package' but also have a wide variety of other wines, beers and spirits to choose from. Sweeten the night some more - our pastry chef can whip up exactly what you are craving and loves working with couples to customize a wedding cake or dessert selection - or both! How about a pie bar with berries plucked straight from our garden? Topped with homemade whipped cream and ice cream- insert drool here! Although the time will fly by, we can help you extend the merriment with a roaring bonfire and fireworks, as well as a late night party in the Tavern. Our ceremony site overlooks our breathtaking meadows and pond, filled with seasonal wildflowers, trees and vibrant foliage during the fall months. Our handcrafted farm benches make a perfect backdrop and the space can sit up to 200 guests. Our storied pole barn is a crowd favorite, perfect for hosting your reception of up to 126 people (which includes enough space for a dance floor too!). If a tent is more your style, you can rent a tent and have it placed directly behind our barn. Perhaps you want to use the barn as a natural extension to host your cocktail hour and/or your post-dinner dance party, while hosting your dinner reception of up to 200 people in the tent. Love to dance? Our classic barn is the perfect backdrop for your favorite band or DJ to kick things up after a great Catskill Feast. Maybe you want to wind down the night with some fireworks to truly wow your guests? We can get them settled with some local bourbon to sip while they roast marshmallows over a bonfire and rest their sore feet from a night of wild barn dancing...all while watching your very own firework display! Thinking about hosting a rehearsal dinner onsite? Our Shandelee Post Garden is full of blossoming flowers, and its bluestone patio is a tranquil space that fits up to 40 guests. Inviting the whole gang? Shandelee Hall is an open concept room in our main inn with built in service bar and can comfortably fit up to 100 guests. Also available on a limited basis for your wedding weekend is East Hill Manor Farm, an expansive and breathtaking property of rolling farmland and meadows. 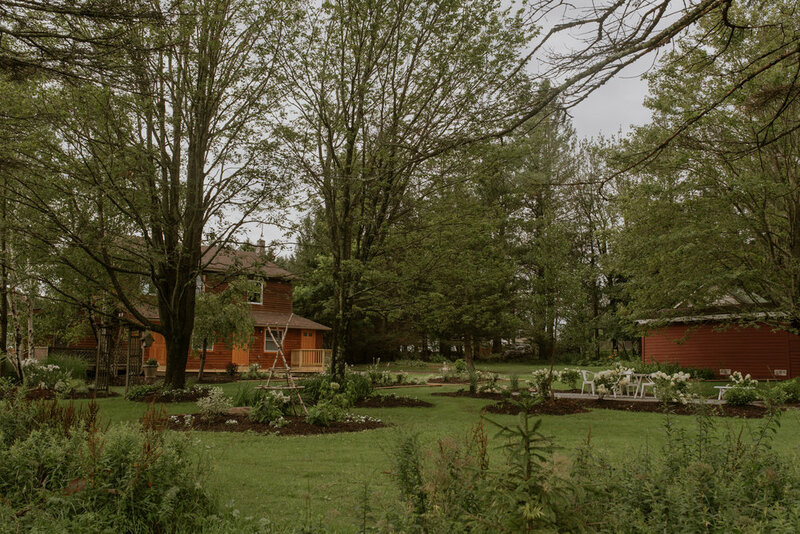 This farm and venue, located 10 minutes from The Arnold, includes access to a pool and pool house for your guests, 360 degree views of the Catskills and beyond, tractor rides and much more.